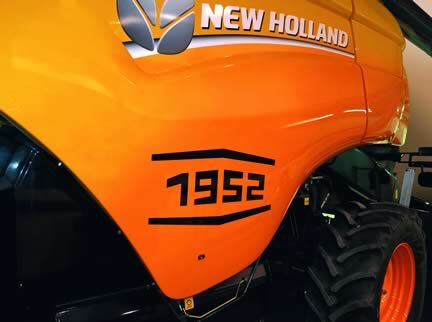 New Holland has produced a unique CX8090 to celebrate its long history of harvesting leadership. Since 1906, Zedelgem in Belgium has been at the centre of the harvesting world. Countless innovations have followed including the launch of Europe’s very first self-propelled combine harvester, the MZ, in 1952 and the birth of Twin Rotor Technology in 1975. Today, state-of-the-art combines are still produced on the same site. The celebratory CX8090 will take pride of place, alongside its MZ ancestor, on New Holland’s stand at the SIMA trade fair in Paris, France. Leon Claeys first opened his machinery shop in Zedelgem, Belgium in 1906, and over a century later, yellow blooded engineers are still producing industry-leading combine and forage harvesters and large square balers. Zedelgem is home to New Holland’s Centre of Harvesting Excellence: the flagship CX and CR ranges, together with the FR range of forage harvesters and the multi-awarded BigBaler large square baler series are designed, developed and produced on-site. A state-of-the-art visitor centre, which has recently been extended, takes customers on a journey from New Holland’s illustrious past, right through to its productive and sustainable present. In 1952 the first MZ ne rolled off the Zedelgem production line. Over 212,000 self-propelled combines rolled off the production line in more than 60 years and the face of harvesting was never the same again. Europe's first self-propelled combine harvester, the MZ produced 65hp and could be fitted with up to a three metre header. A machine which can trace its history directly back to the original MZ, the CX8090 is the world’s highest capacity conventional combine, producing up to a maximum of 490hp. Acclaimed New Holland four drum technology ensures the biggest and heaviest threshing performance in the industry providing high inertia for smooth running and reduced drive line road, together with gentle straw handling for long, unbroken straw. Furthermore, the self-levelling cleaning shoe guarantees full cleaning capacity on slopes up to 17%.The CX cab is an industry standard for visibility, comfort and low noise level (74dB(A)). The CX8090 is fully Tier 4A compliant thanks to its ECOBlue™ SCR Cursor engine, which can reduce fuel consumption by up to 10%, as well as significantly cutting carbon emissions. The CX8090’s distinctive livery boasts painted, graduated-effect side shields, which change from trademark New Holland yellow through to the rich tones of Claeys orange and evoke the fusion of these two harvesting giants, which has culminated in the development of today’s state-of-the-art machines. The anniversary edition also features a historical 1952 badge in original Claeys font to further reinforce its illustrious lineage. The cab has been lavishly upholstered in the very softest leather, specially dyed in Claeys orange, with contrast black stitching and an intricately embroidered headrest, further evoking over 60 years of self-propelled combine harvester heritage. New Holland worked closely with Centro Stile, Fiat’s design house, to ensure that the essence of the original MZ trailblazer was distilled in the CX8090, the most modern of conventional combines.